1. 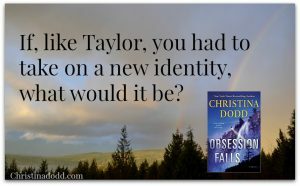 In the first chapter of OBSESSION FALLS, we discover Taylor Summers has suffered failed personal relationships and seeks a way to put interest and meaning into her life by pursuing her dream of being an artist. As an adult, what dreams have you abandoned as impractical? What skills would you now pursue if you had the opportunity? 2. Taylor goes alone in Idaho’s isolated Sawtooth Mountain Wilderness region to sketch. She realizes she is about to witness a child’s murder by paid assassins. She’s armed with nothing more than a drawing pad and her pencils, yet she knows she has to somehow distract the killers. What would you risk to save a child’s life? If you could look into your futures and see the consequences she faced — loss of reputation, identity, poverty, hardship and pain — would your answer remain the same? 3. After Taylor saves the child, she’s on the run in the wilderness, winter is coming on, and she faces the constant challenges of finding food, shelter and warmth. Would you survive such extremes? Why or why not? 4. As the harsh winter gains strength, Taylor survives by breaking into unoccupied vacation homes. While reading the news on the internet, she discovers her character has been maligned; she has been accused to orchestrating the child’s kidnapping. Do you believe, based on what she read, that Taylor was valid in believing that she should not return to civilization, that there is no justice for her there? She steals food, shelter, and firearms. To survive, are you willing to commit a felony? 6. Using a pseudonym, Taylor at last gains employment at a company catering parties to the wealthy homeowners in the area. She believes she can escape the desperate life she’s been leading… then in one of the most chilling moments in the novel, she witnesses a brutal assassination. Once again she barely escapes with her life. When at last she arrives in Virtue Falls, she makes friends, builds a business and an identity. Yet she decides to seek justice for herself, claim her true name, and somehow defeat the relentless villain who pursues her. If you had survived such harrowing circumstances to reach a safe haven, would you risk all you had gained to clear your reputation and live without fear? Or would you take your chances and live quietly for the rest of your life? 7. If, like Taylor, you had to take on a new identity, what would it be? 1. In the novel VIRTUE FALLS, Kateri Kwinault was the local Coast Guard commander. During the devastating earthquake and tsunami, through no fault of her own, she lost a Coast Guard cutter and (almost) her life. She is court martialled (standard Coast Guard procedure with the loss of a vessel) and forced to resign her post. Many Virtue Falls residents, already prejudiced against Native Americans, judge she has proved herself incompetent. Because of gender, nationality or race, have you ever faced this kind of injustice? 2. Kateri believes she was consumed by the Native American Frog God and reborn to this earth, and in fact she holds special powers. When Taylor arrives in Virtue Falls suffering from injury and hypothermia, Kateri is able to breath life into her. Under the right circumstances, Kateri also is able to make the earth move and with that gift she changes the chain of Coast Guard command. Do you believe in the supernatural? Have you ever had anything otherworldly happen to you: seen a ghost, had a premonition, other? If you had special powers, would you use them and in what circumstances? 1. Because of the role Kateri plays in saving Taylor’s life, the two women become fast friends. What do you think their friendship contributed to their successes? Taylor and Kateri face incredible, difficult challenges. In their own ways, they both triumph, yet they both also pay a terrible price. Do you believe reading novels in which the female protagonists strengthens your own ability to face the trials of your life? Discuss your reasons. You may share your own stories and experiences. 2. Both Taylor and Kateri find themselves manipulated by wealthy, powerful men playing at life according to the rules of a deadly online game. Yet Taylor tells Kennedy, “You don’t know jackshit about survival,” and in the end, she saves her own life and his with cunning and strategy — and by breaking the rules. Do you believe that women are more likely than men to “think outside the box” and find an unlikely alternative strategy? If so, do you believe that’s a learned behavior or a gender-based behavior? Or are such gender generalizations unfair and, based on the person, a matter of degrees? 3. What did you think of the ending of OBSESSION FALLS? Have you read the alternative ending (available on my website)? Do you like it better? 4. Finally: What are the themes you see in OBSESSION FALLS? What inspired you? What angered you? What haunted you? What scene or scenes will you remember best about OBSESSION FALLS?